Drinks: peach ice tea and Red soju name: Peach Beach Please! So this time I went to Gangneung for a Waygook farmers’ market (which was more like a potluck the those who brought no food had to pay for the food). Among the awesome food was pulled pork, which was amazing. The market which is organized by the owner of So Zac’s cafe every year (I think). If you are in the the Gangwondo area around spring time look it up on facebook (because that is what people do in this portion of time) and support those who put a lot of work into the food they sell. Next you move to the coffee mile (which is basically a stretch of coffee shops along the Gangwondo coast). Here you can find a guest house where the bunk beds are shown through the windows. It might be cool to stay there or it might be better to stay at a place with blinds to sleep in late. The following are pictures of the cafes along the way (which if you have a large party on a sunny day, good luck finding a place to sit down and enjoy coffee). This is a beautiful strawberry tart that tasted as good at it looks. Then a couple of blocks away from the coffee mile is a place by the beach where I was told great hamburgers were sold (for a reasonable price too, the most expensive burger was about 8,000 won). However somehow the day turned from fun sunny warm day to pre-scary movie about killing sirens. But that did not stop a nearly wed Korean couple from taking pictures and hitting the groom on the bottom of his foot (according to some other Koreans that saw us looking at the whole scene weirdly, told us). Yup not sure what is going on here. More scary mist and such. And finally the warmth of an over crowded tiny burger shop. This is the address I think (to be honest I was starving so most of this was just a blur until I was able to obtain nourishment). And then finally the food arrived! The burger above was the bacon mozzarella burger. The one above was is the mozzarella spicy burger and below is the regular spicy burger. All was right with the world because the burger was awesome. In another note, in my almost seven months in this country I had never come across a married couple cab. Another one was spotted in downtown Gangneoung so it is a thing. Also in Downtown Gangneoung is the Teddy Bear Cafe. As it’s name says it is a cafe full of Teddy Bears (large ones small ones, some that tell you to be with them forever and you can chose the tone of creepiness you want to give that voice inside your head). Next up is Maggeoli or rice wine found in Korea. The most common way to drink maggeoli is with cider (a lemon lime soda here). In this maggeoli bar we found fruit flavored maggeoli (if you have an issue with texture I recommend staying with the traditional way to drink it. In severe cases of texture things stay away from maggeoli). So moral of this story, there is no such thing as much dessert, teddy bears can be supper creepy if they are six feet tall and the weather has taken vengeance on them, and always be aware of your texture tolerance for drinks. So while living in South Korea is fun and is full of adventures and cultural experiences, there is one thing I am mainly angry about and that is that Korea lacks an understanding of Brunch or breakfast as I have come to know it. Which is why as soon as I saw that a brunch place was near my guest house in Kyoto I took my chances and ate there. After an amazing brunch I headed to the Fushimi Inari Shrine, the shrine of a thousand gates (and much walking). The messenger of the god that this shrine was build for is a fox. And that is why there are so many fox statues around the shrine. The foxes are all dressed up also because of the New Year. Each object the foxes carry is specific to a message the god wants to send (but you can look that up if you are interested). The gates are meant to be good for businesses which is why there are so many (they have definitely passes the thousand gate mark). The gates take you all the way up the mountain and the down through a cemetery where people who really benefited from putting up a gate now rest (because it is expensive). Here is the beginning of the cemetery (I did not make it all the way up the mountain because we had other places to go. However all of it was beautiful and kept that old time influence with the modern life that we know Japan for (there were automatic sliding door that looked like traditional door in the little shops selling things by the monks of the shrine. There will no doubt be more gates added to the trail but for now I like the colors and the contrast with the mountain. Next in the day was Toji, everyone was dressed up and I really enjoyed seeing the people in Komonos go by. Again the temple was in a mountain/hill which meant a nice but tiring walk (again). This Shrine was more commercial than Fushimi because it had restaurants and more things were being sold much closer to the shrine. If you do travel here make sure to get the Sesame ice cream ( I loved it as you can tell because I only remembered to take the picture after half the ice cream was gone). While getting all the way to the top may be difficult it is totally worth it because the view makes it so. Again, sadly doe to y timing all renovations were being done to the pagoda due to the coming new year. However the structures I was able to see were lovely and made up for most of it. Remember comfortable shoes are very important! It is spring in South Korea and that means cherry blossom time! So I went to Jinhae to go to the famous cherry blossom festival held every year. This is serious business (you know how in the fall pumpkin everything hits the United States? Cherry blossom everything hits Jinhae). I had cherry blossom cookies, chocolate, late, lemonade, bread, swiss rolls, macaroons (actually they ran out of macaroons, but they looked pink and really goo!) and tons of cherry blossom trees in full bloom. But the story is not all cherry blossom color. At the beginning of out journey from Busan (Heundae to be exact) to Jinhae we were a group full of hope ready to see the cherry blossoms and dressed for a nice warm spring time day. The picture below is of us standing in a bus of a trip that takes an hour (yeah we knew this when they asked us if anyone wanted to stand on the bus, we also saw that the line to get on the bus was about the size of a Harry Potter premier). So we got on the bus and tried not to fall on any Koreans. Jinhae was all that we expected there were cherry blossoms in every direction and it all looked gorgeous. The line never changed size even before we got into the bus it just kept growing as people desperate to leave kept buying tickets and standing on either one of the two lines and buses kept rushing in and taking as many people as they could back to Busan. As my friend Jennifer put it it felt like being in the movie Titanic because there was water everywhere, we were soaking wet (as you may recall we were dressed for a warm spring day and an umbrella was ever so under appreciated at the beginning of the day and then they were sold out in all of Jinhae) and we just wanted to board a mode of transportation to dry land. So we finally did make it into a bus after maybe three hours of standing in the rain with no rain gear for about three hours (I was unable to move my hands or feel my fingers or toes). As we were on the standing line there were no seats for us except they did miss an empty sit which was able to take and then just fall asleep for a big chuck of the way back to Busan. Moral of the story if the rainy season is anywhere near, TAKE AN UMBRELLA or at least a rain jacket. If you arrive at a bus station and there is a line of about forty people waiting to get on the next bus (because the current bus is full and leaving) buy tickets right there and then. And one last thing tights are awesome and they dry quickly (unless the rest of your clothes is completely drenched in which case your tights will dry and remain wet at the same time) but do not sit on the train or next to people because you will get them wet also (because osmosis and your clothes are probably saturated with water). The last picture is of my camera fogging up due to all the moisture in the bus. Boredom has once again become my worst enemy!, and what is a person who gets bored easily to do? Well I started out baking, my apartment did not come with an oven but because foreign English teachers are constantly changing, I was able to get a toaster oven for about ten US dollars. Right being the nerd I am, I have tried to put my efforts to Doctor Who, since it has started and you know there is also work. But I have this immense amount of alone time (don’t get me wrong I like alone time, I crave alone time specially when other people are around).But some times it feels like an outside force enforces the alone time I that I get, and as anyone who has read the Empirical studies on people and aloe time can tell you, the choice to be alone is way different than being force to be alone. which makes people use electrical shocks to dull out the boredom of forced alone time. Anyways I have taken up origami (I have made a center piece out of paper cranes), SO now I have combined the cookie making with the origami and the result were the pictures below. Till next Saturday or when ever I have more to write about! Mureong Valley, if you want to cab her you can say Mureong chegok (because they will not understand valley). There is an option of taking the bus here but I did not do that so you may have to go to the information center in Donhae (yes this valley in the town of Donghae in the Gangwondo area. A 1.650 won bus ride or you can just cab to the valley). So once you get off the taxi you will see the shops all around, good place to get souvenirs along with places to eat and drink. After you are walking for a while you will get to the area where you can buy your admission tickets which are not at all expensive. Once you have passed the gate feel free to wander around the valley. There is a couple of rivers so you can pack a bathing suit and towels (most Koreans had tubes and other bloating devises along with tents they do not kid around with comfort they will carry all this stuff around). You may also want to have a change of clothing because well you never know when you may thing you can make it to the other rock in the middle of the river and then you don’t. There is a temple where people can come and stay to enjoy the nature and what not else of the valley. These are rather small but they find strength in numbers so be prepared to work out your thighs. This was the chosen spot for a break/ picnic a small but deeper than my legs are long led me to believe I could make it across with out having to get my clothes wet (It did nit workout so well for me). 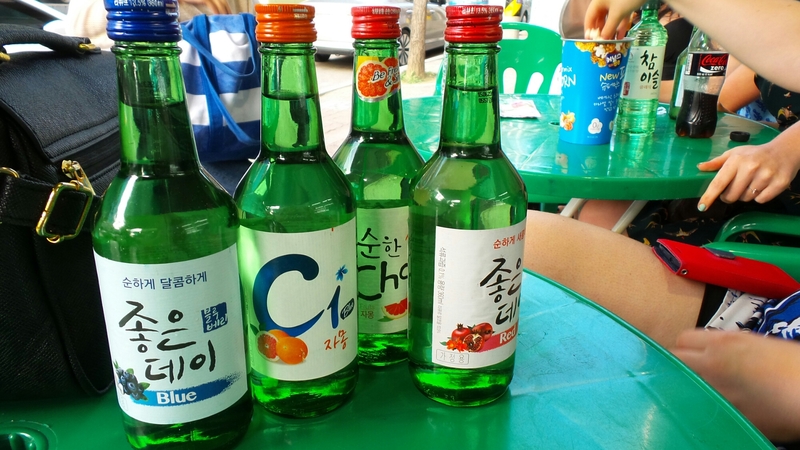 After finishing the rest of the hike it was time to see what the shops outside of the valley entrance had to offer and came upon Makgeolli (in it’s truest form and we had it with a Korean soft drink called Cider because it tasted better). The following is what they call a Korean pizza, which is essentially a giant potato pancake (it was great and even though the amount of hiking did not equate the caloric intake it did not matter). When the day came to an end a taxi took us to a tore where wine was bought to be enjoyed at the Donghae beach (it was also a bit rainy yet the summer heat was very real). Happy travels and drink responsibly!